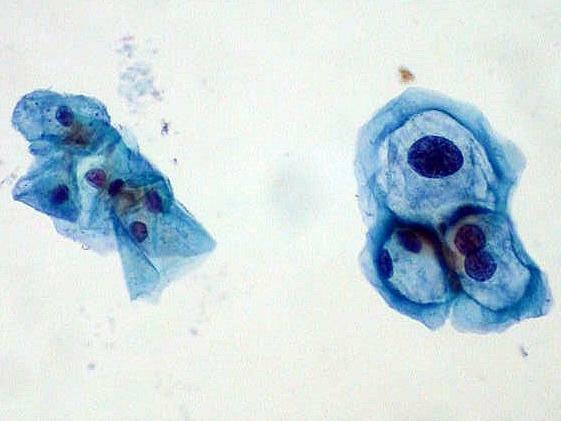 Cells gathered during a Pap test. Those on the left are normal, and those on the right are infected with human papillomavirus. When it comes to testing women for cervical cancer, the nation sure could be doing a better job. Too many women who don't need them are getting regular Pap tests. Other women who could benefit from the tests aren't getting them, often those are women without health insurance. The latest data from the Centers for Disease Control and Prevention show that about 60 percent of women who've had total hysterectomies are still being tested for cervical cancer, despite not having cervixes anymore. That statistic sent Reuters health and science correspondent Sharon Begley right up the wall. "Angry that 1/3 of US med $$ goes to useless 'care'? Get ready 2 scream: 60% of women w/hysterectomy keep having Paps," she yelled on Twitter. The current consensus is that Pap tests shouldn't be ordered for women younger than 21. Generally speaking, women 21 to 65 should get a Pap test every three years. For most women 30 to 65, the interval for testing can be extended to five years, if they're also getting a test for the human papillomavirus, a risk factor for cervical cancer. After 65, screening isn't recommended for women except under special circumstances, such as a high risk for cervical cancer. And testing isn't recommended for women who've had a hysterectomy and have no history of cervical cancer or worrisome test results. About 90 percent of hysterectomies aren't done for reasons having to do with cancer, by the way. Inappropriate screening can lead to false alarms that spur anxiety and additional medical tests and procedures. Two studies published in the latest Morbidity and Mortality Weekly Report focus on opposite ends of the screening spectrum. Guidelines about screening for cervical cancer in younger women do seem to be helping some, but there's a lot of work left to do. Fewer women under 21 are getting screened. Some 48 percent of women 18-21 reported in 2010 that they hadn't ever had Pap test compared with 26 percent in 2000. But the percentage of women 21 to 30 never having been screened also rose — to 10 percent in 2010 from about 7 percent in 2000. In 2010, about two-thirds of women 65 and older who hadn't had a hysterectomy reported having a recent Pap test. That's down from nearly three-quarters in 2000, but it's not a huge improvement. "Although recommendations have resulted in reductions in screening posthysterectomy and of those aged ≥65 years, many women still are being screened who will not benefit from it," the researchers wrote.